Observations: What Will $100 be Worth in 10 - 20 Years? Inflation is one of the biggest risks that current and future retirees face. Given today's life expectancies, even relatively low rates of inflation can devastate the purchasing power of a pension or uninvested cash during your retirement years. How great could the impact be? See below. Try my new interactive future inflation impact calculator. It does the same calculations as the graph below, but for any number of years, and for any inflation rate. Then come back to this post; graphs are still better for seeing the big picture. What Will $100 be Worth in 5, 10, 20, 30... 50 Years? 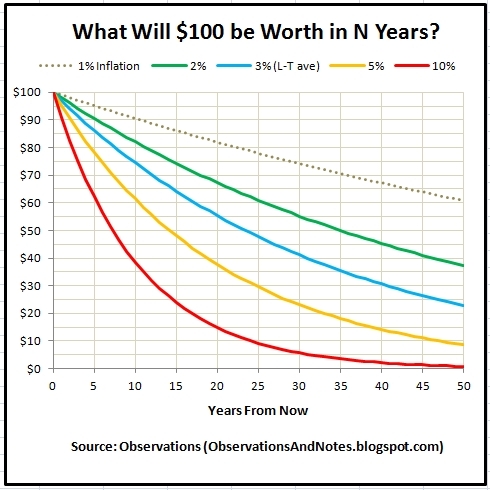 What Will $100 be Worth in N Years? Over the last 100 years, U.S. inflation has averaged about 3%/year. As you can see from the graph above (click to expand), even at these apparently benign rates (the blue line), within 20 years the purchasing power of a fixed pension will be almost cut in half. Twenty years is not a long retirement these days; most advisors recommend that you plan for thirty. Some retirements last even longer. As I suggested in the above linked post, inflation hurts those on fixed incomes (pensions & annuities) and those holding cash (or near cash) most. Example: What Will $10,000 be Worth in 10 Years (2023)? 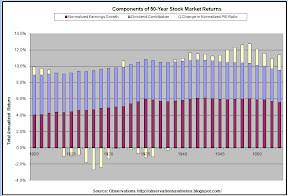 How much will your pension or "stash" be worth in 10 years? Obviously, it depends upon the future rate of inflation. Inflation has been as high as 20%, and as low as minus 10% (i.e., deflation) for a single year. (For chart, see the inflation post) However, for periods of five or more years, the range has been around 1.5% to 10%; for ten years or more, it's more like 2.5% to 7.5% (I'm excluding the deflationary periods). The long-term average is about 3%. As you can see from the above chart, if we experience average inflation (the blue line), in 10 years $100 will be worth about $75 (the actual number is $74.41). It follows that $10,000 will be worth about $7,500. And, a monthly pension or annuity of $1,000 would be equivalent in purchasing power to about $750/month in today's dollars. (You can calculate the exact numbers using the Inflation Calculator that I used to prepare this graph. What Will $10,000 be Worth 20 Years From Now if There is Low Inflation? Lately, inflation has been somewhat subdued. From 2002-2012 it averaged 2.5%/year; two of the last five years were below 2%. Suppose that for the next 20 years inflation only averaged 2% (the green line). In that case, twenty years from now your $10,000 would be equivalent to $6,730 in today's dollars. 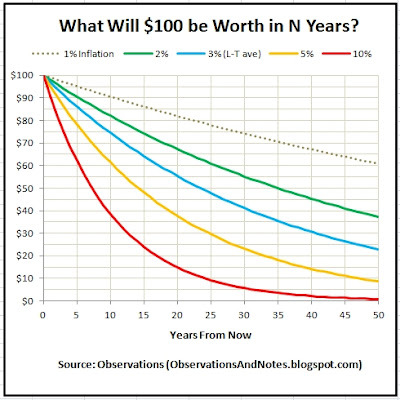 How Much Will $100,000 be Worth in 20 Years (2033)? On the other hand, suppose inflation ticked up to 5%/year (the orange line) -- a seemingly small increase. In 20 years the $100,000 that you have stashed away in your safe deposit box for an emergency would only be worth about $38,000. Maybe more relevantly, every $1,000/month you are currently receiving in a non-cost of living adjusted pension or annuity would only be worth $380. The $10,000 in the paragraph above would be equivalent in purchasing power to $3,800 in today's dollars instead of $6,730. What Will $1,000 be Worth 30 Years From Now if we Have High Inflation? The worst inflationary period I have experienced was between 1977 and 1982; inflation averaged 10%/year! If we were to have that level of inflation (the red line), in 30 years $1,000 would be reduced to the equivalent of less than $60 ($57.31) in today's dollars! Here's a handy shortcut. The rule of 72 says that if inflation is N%/year, prices will double in approximately 72/N years. For example, at 3% inflation, prices will double in (72/3=) 24 years, and at 2% prices will double in (72/2=) 36 years. If prices double, what you used to be able to buy for $50 costs you $100. As a result, your purchasing power would be cut in half; $100 would have the purchasing power than $50 has now. If you check the chart, you will see that the 3% (blue) line reaches $50 at about 24 years and the 2% (green) line gets there at 35 years. What Would $10,000 in 19xx be Equivalent to Today? Similar to this post, but comparing today's dollar to dollars in the past, using actual historical inflation rates. What Will $10,000 be Worth in 10 Years? (Bonds/CDs) Similar to this, but if the money is invested. 100 Years of Inflation Rate History: Includes 100-year chart & a fuller discussion of the impact of inflation. The Life Expectancy Problem: How Long Will You Live? Why inflation is so important to retirees. For lists of other popular posts see the sidebar to the left or the blog header at the top of the page. Thank you. Excellent answer and explanation. Just a little typo in the paragraph about the rule of 72, "3% (blue) line reaches $50 at about 35 years and the 2% (green) line gets there at 24 years," should read that the 3% (blue) line reaches $50 at 24 years and the 2% (green) line reaches $50 at 35 years. Thanks!